We are not a Bike Shop: we don’t fix bikes for you. What we do is teach people to work on their own bikes. Many people already know how to work on bikes, that’s fine too, we’re here if you need us but we’ll leave you alone if you don’t. 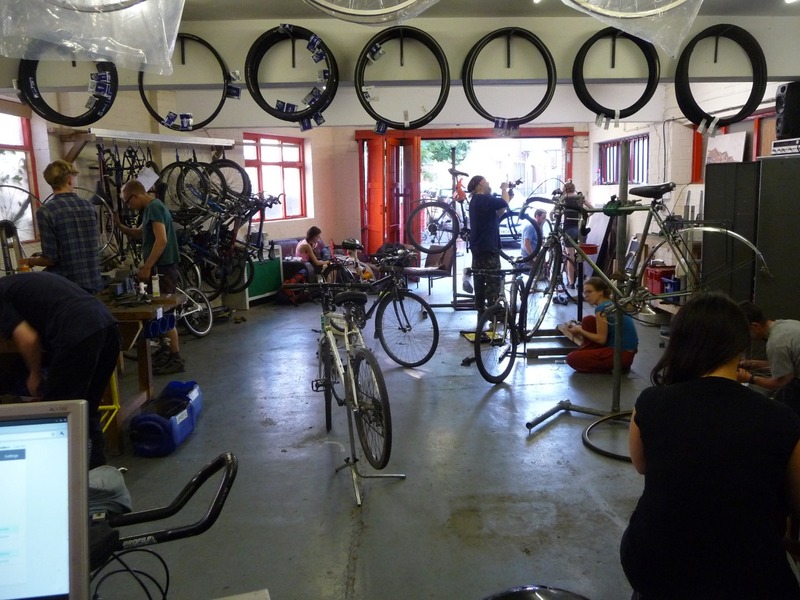 We try to be hands-off with bike repair so that you have the space and time to learn at your own pace but if you have any questions then ask and we’ll do our best to help. When you come down to Pedallers we hope to welcome you to the space and say hi. Then if there is a spare bike stand we will help you get set-up and give you a tool roll with most of the common tools: spanners, pliers, allen keys e.t.c. If you need other tools then we have a large tool board you can use, all you need to do is ask. If you have any problem then always feel free to ask for help. We will try to show you how the tools work and together make your bike work better. We have truing stands, cassette and freewheel removers, bottom bracket tools, chain tools, chain wear indicators, headset spanners, crown race remover, derailleur alignment tool, bottom bracket taps and facing tool. We don’t have headtube facing or reaming tools or tools for more specialised high-end bikes. We stock lots of second-hand parts: gear shifters, brake levers, headsets, wheels, cranks, derailleurs, mud guards, pedals, tyres e.t.c. We also have new parts such as brake pads, cables, freewheels, chains, nuts and bolts, bearings, tyres e.t.c. We want to be affordable to everyone, but we do need some cash to pay our rent, utilities, insurance, replacement of tools and general upkeep of the workshop. Your membership or donation also covers oils, grease, cleaning fluids and so on. We are volunteers and we don’t get paid, we just enjoy it and want to help other people who ride bikes. You can become a member of the Pedallers’ Arms which gives you access to the space, tools, books and our support and guidance. Membership costs between £15 and £40 a year depending on how much you think you can afford. We know that some people would prefer to be told exactly how much to pay, but we’re asking that you think about what access to Pedallers’ is worth to you and what you can afford to pay. Someone might use the workshop on a weekly basis and they feel that they can afford to pay £15 a year. That’s fine with us. Someone else might use it just as regularly but feels that they can afford to pay £30 a year. Also fine with us. Someone else might not actually come that often but wants to support what we’re doing and chooses to pay £40 a year for membership. Also fine. We’re not going to question you about your circumstances! If you don’t want to sign up for a year’s membership then we ask that you make a donation of between £2 and £10 each time you visit the workshop. Give what you think it was worth – how much money do you have, how much time did you spend here, how many tools did you use, how much guidance did you get, how useful was it, and so on. If you’re not able to become a member or make a donation then we are still happy for you to use the workshop and tools, and to get help and guidance. 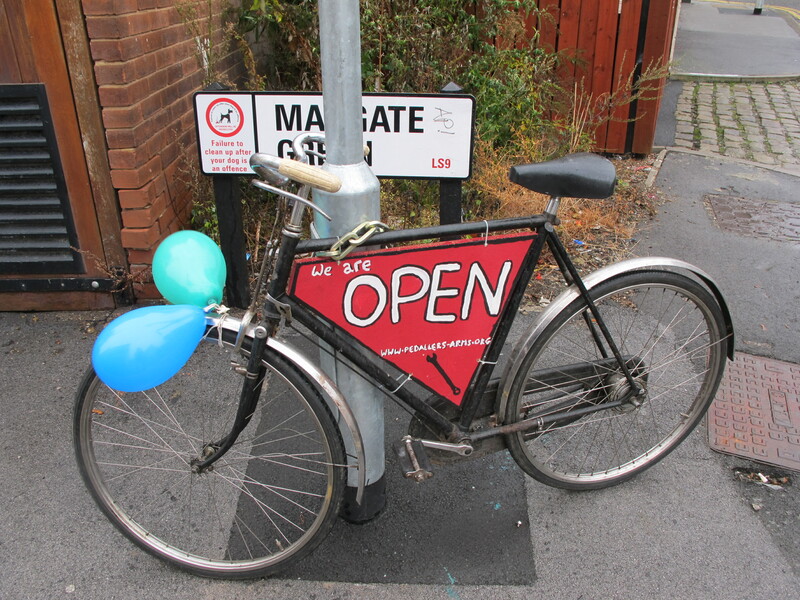 We do have some bikes but not many, you can email try info@leedsbikemill.org, they are connected with Pedallers and sell more bikes. What a cool idea! I need to replace my rear brake pads but am struggling a bit so may well pop in. A great place and fantastic people, If you need a hand or a wee bit of advice they are happy to help. How much is it for drop in sessions.